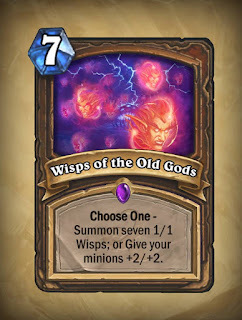 As some of you may know, I'm a regular player of Blizzard Entertainment's multiplayer collectible card game, Hearthstone: Heroes of Warcraft, and I have to say I'm pretty stoked by the upcoming release of the new expansion, Whispers of the Old Gods. I've been poring over the cards, and I'd like to take the time to share my thoughts on them. Right now, just about half the set has been released for us to peruse. Blizzard releases a few more each day. To ensure I have the lot reviewed by the time the expansion goes live, I'm going to look at a hefty number of cards: around 14 at a time! Please note that all images are property of Blizzard Entertainment unless otherwise specified. (1) Is it a viable competitive card in Constructed? Millhouse Manastorm - You know of what I speak. As an additional remark, I should like to mention that any ratings will necessarily be provisional. In addition to the removal of some of the older card sets from what will become the Standard play format, I'm led to understand that Blizzard will be altering many previously-released cards in an effort to reduce the overall power level of the game. That being the case, I may well end up underrating many of the cards in Whispers of the Old Gods. With these general remarks done with, on with the reviews! 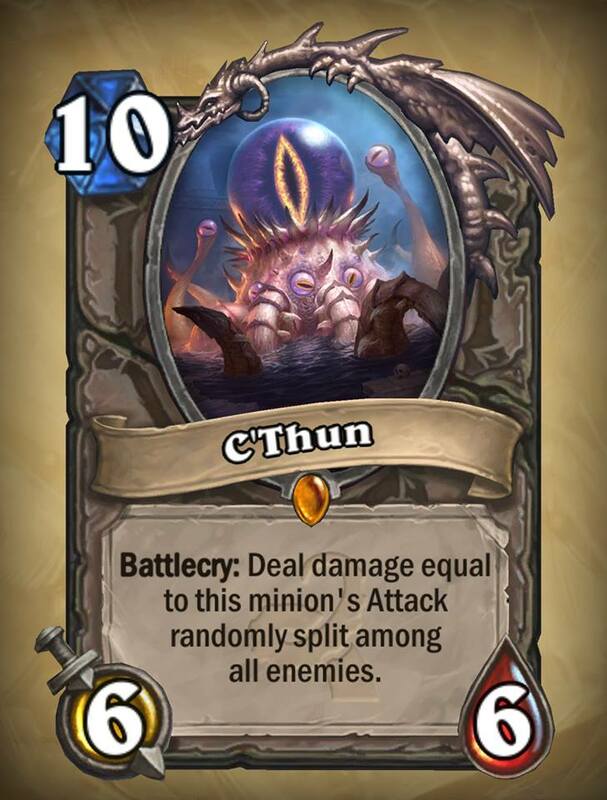 C'Thun is one of the Old Gods, ancient and evil beings that came to the world of Azeroth some time in its primordial beginnings. It was defeated and imprisoned by the titans, the creator-beings who shaped and brought order to Azeroth. Its machinations led to the creation of the silithid and qiraji - insectoid creatures that serve its will. It appears as something of a cross between the Zerg Overmind, Sauron, and a Lovecraftian horror. In World of Warcraft it is one of the early game's major endgame antagonists, and is a "dungeon boss" in the large-scale "raid" dungeon of the Temple of Ahn'Qiraj. 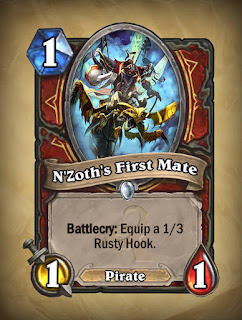 And now, it appears in Hearthstone! But does it see you? 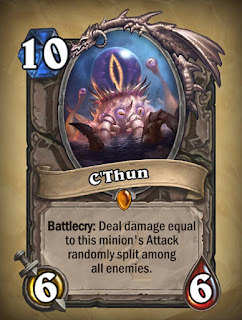 On its own, C'Thun is pretty underwhelming: a 6/6 body that deals its Attack value in damage to random enemies as a battlecry for 10 mana is nothing to write home about. 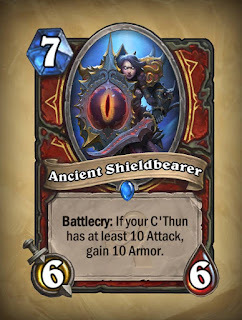 However, multiple other cards can buff C'Thun, making it bigger - and therefore also boosting its battlecry. What's more, these effects will take effect wherever C'Thun may be: in your deck, in your hand, or in play. Some obvious synergies include: Rogues using Shadowstep to return C'Thun to their hand, then perhaps playing Youthful Brewmaster to call the discounted C'Thun back to their hand again; other classes getting a discount, via Emperor Thaurissan, on C'Thun and Brewmaster to do the same thing (although less often) - Druids could use Innervate instead; playing C'Thun with Brann Bronzebeard on the board to get a double battlecry effect; playing Alexstrasza the turn before to reduce the opponent's health in order to make C'Thun's battlecry more decisive; that sort of thing. 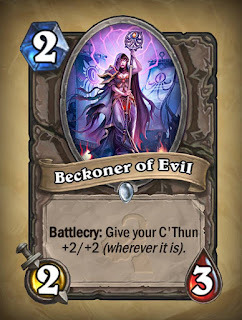 Best of all, the minions that buff C'Thun are themselves solid cards (as we shall soon see), making their inclusion in a deck much more suitable. In short, C'Thun is the kind of card you can build a deck around. 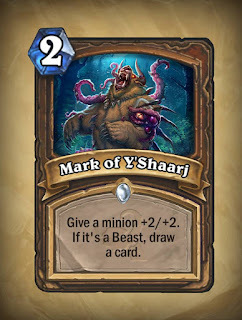 To be sure, there are risks: a buffed C'Thun would die very easily to Big Game Hunter or any big-minion-removal. An ill-timed play could see you play into Eye for an Eye or Freezing Trap (if C'Thun stays on the board long enough). But that is true for any of the main "finishers" such as Alexstrasza or Dr Boom. C'Thun is also a pretty slow card - without some kind of discounting or Innervate, it appears 10 turns in, by which point it may be too late for its battlecry to have a decisive effect. Because you have to build a deck around it, and can't fit it into just about any deck the way you can with, say, Dr Boom, C'Thun doesn't merit an Excellent rating. 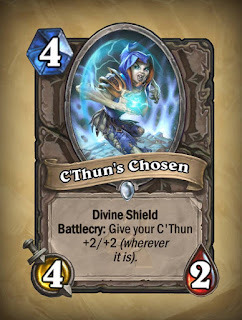 But because when you do build a deck around it, the deck will be decent and C'Thun will grow in effectiveness, it merits a Good rating. Speaking of the cards that buff C'Thun, I should now like to discuss the cards that do so. 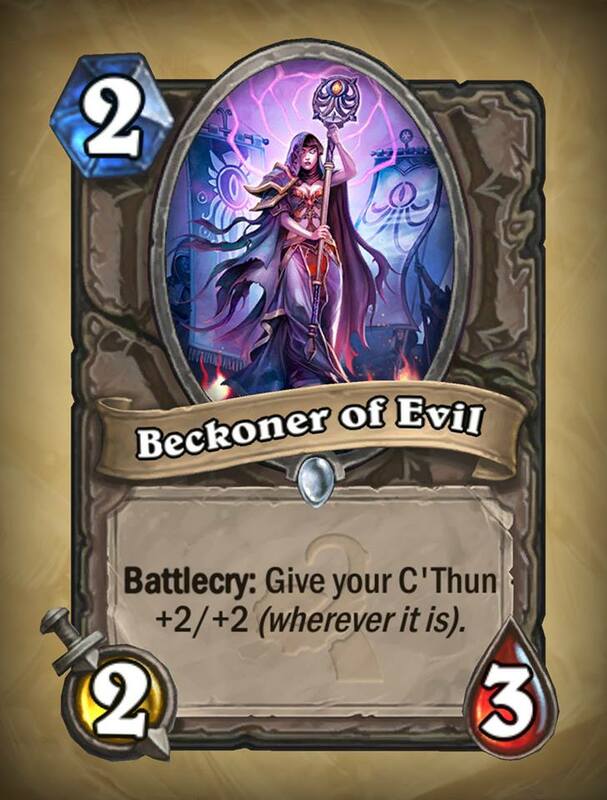 So far, there are four minions that buff C'Thun (in order of mana cost): Beckoner of Evil, Twilight Elder, C'Thun's Chosen, and Skeram Cultist. It beckons the way to evil. Somehow. Doing his best to get C'Thun from wherever it is to HERE! "Skeram" is what I'm doing if I see one of these things. Of these, most apply a one-time buff to C'Thun as a battlecry. 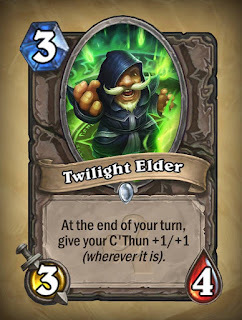 The Twilight Elder, by contrast, buffs C'Thun at the end of each of your turns it remains in play. 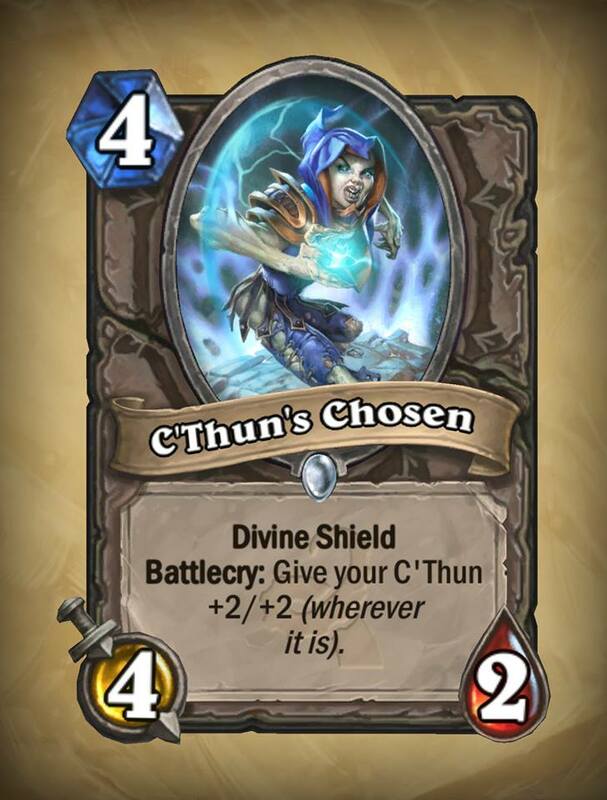 In the end, these all merit a Good rating because they all have decent stats for their mana cost (or, in the case of C'Thun's chosen, Divine Shield on top of okay stats) and they have effects that improve a C'Thun deck's primary win condition. 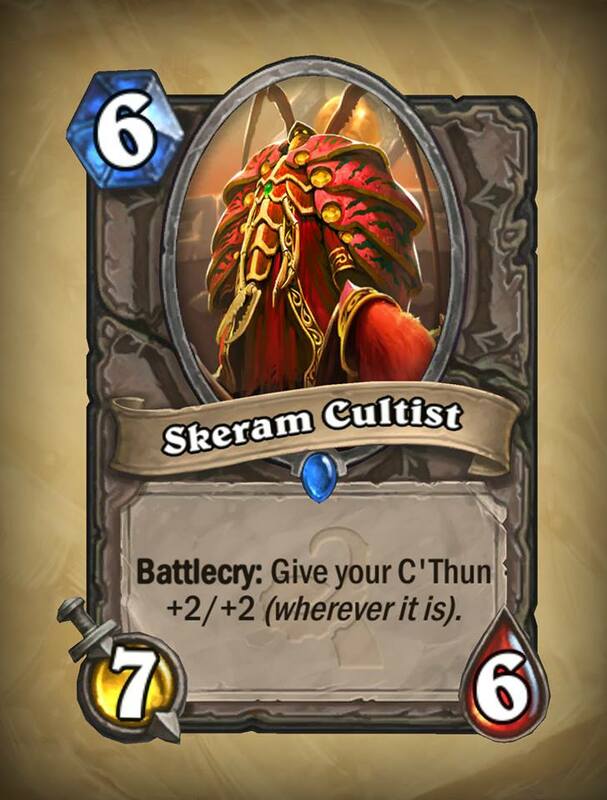 There are a couple more cards currently associated with C'Thun. 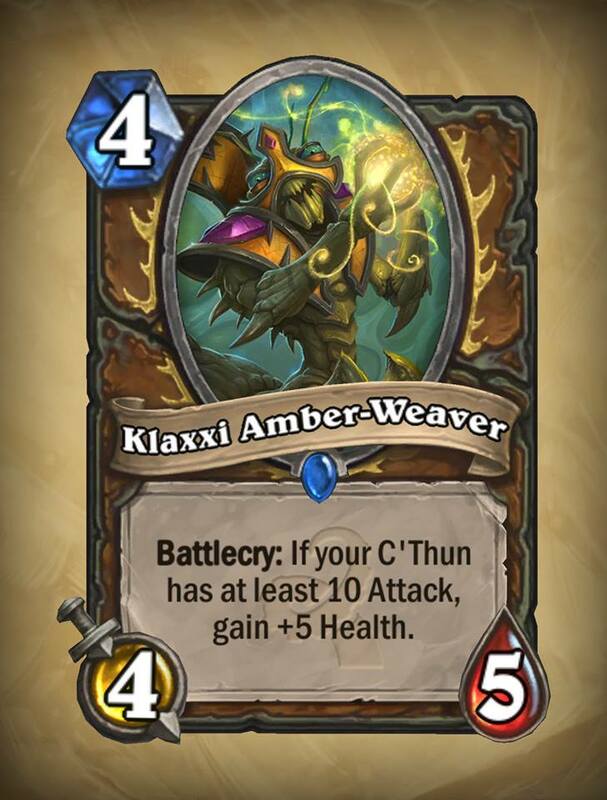 These are the Druid card Klaxxi Amber-Weaver and the Warrior card Ancient Shieldbearer. How do you weave fossil tree sap, anyway? It's ancient. And bears a shield. Both of these cards have an additional effect so long as C'Thun's Attack value is at least 10, which should be reasonably achievable during a game. The Amber-Weaver's effect is a self-buff that improves it's Health; while the Ancient Shieldbearer adds Armour to its Hero. 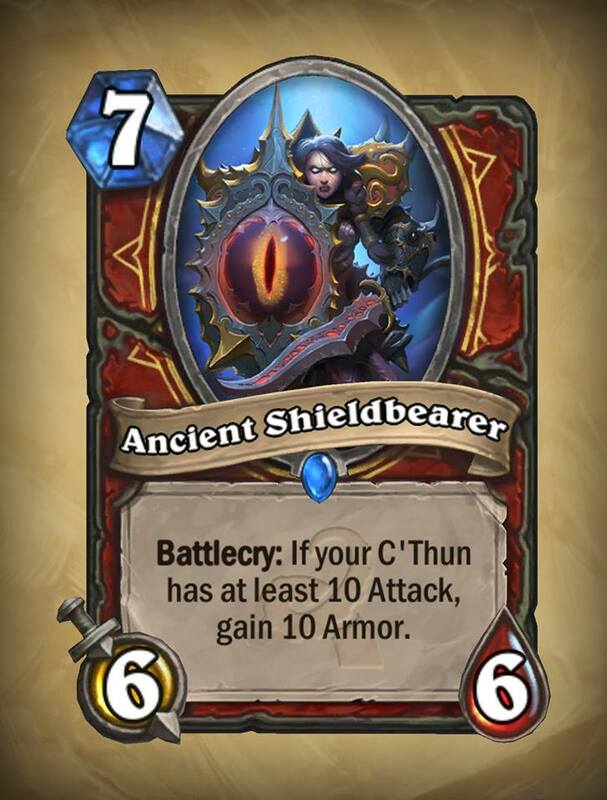 The latter card appears to be a partial replacement for the Shieldmaiden - partial because it functions only in C'Thun decks. The Klaxxi Amber-Weaver merits a Good rating because its baseline stats are the same as Chillwind Yeti, which is still a respectable minion in its own right - and then it can become much more durable on top of that because of the battlecry. It probably comes close to being Good because the battlecry ought to be reliably triggered, and because the amount of Armour it provides is so geat. Since these two cards are class cards, I'm going to segue into discussing the other cards from their respective classes. That's quite the prosthetic, wouldn't you say? It's positively ravishing.... wait, got a word wrong. Bet it can't say "Arrrrrr! ", though. Patrons and whatnot, then play Blood Warriors to fill up your hand without draining your deck. I'm not sure it can take the place of any card draw, but it would be nice if it could so you had more room in the deck for midrange minions. As for Tentacles for Arms? Well. I suppose it could see some use in a fatigue deck, since it keeps coming back, guaranteeing you can deal damage even when you and your opponent have both run out of cards. 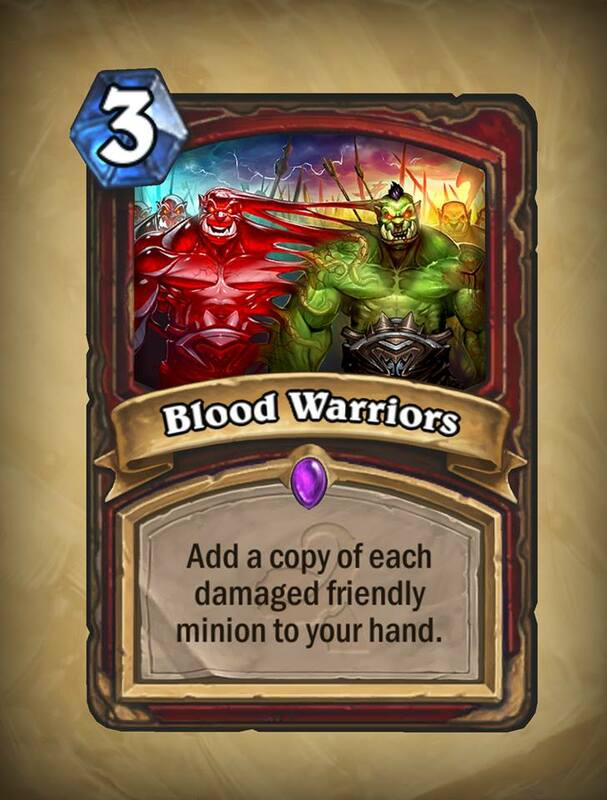 Beyond that, 5 mana for 4 damage and a card (once again, that does not drain your deck) is not bad, but it lacks the fighting power of pretty much any other warrior weapon, making it suboptimal for either board control or hitting the opponent's face (except in the aforementioned fatigue scenario). 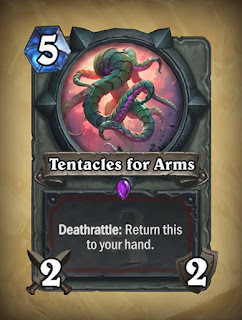 The only thing keeping Tentacles for Arms from having a Terrible rating is its situational usefulness in a fatigue deck, where it could actually prove decisive, especially in a fatigue race against another warrior or a priest. 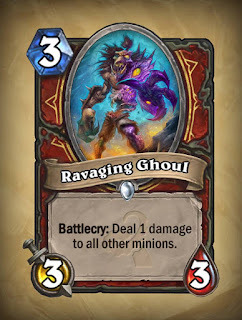 Ravaging Ghoul merits a Good rating because it is an obvious choice for Patron/masochist-style decks. 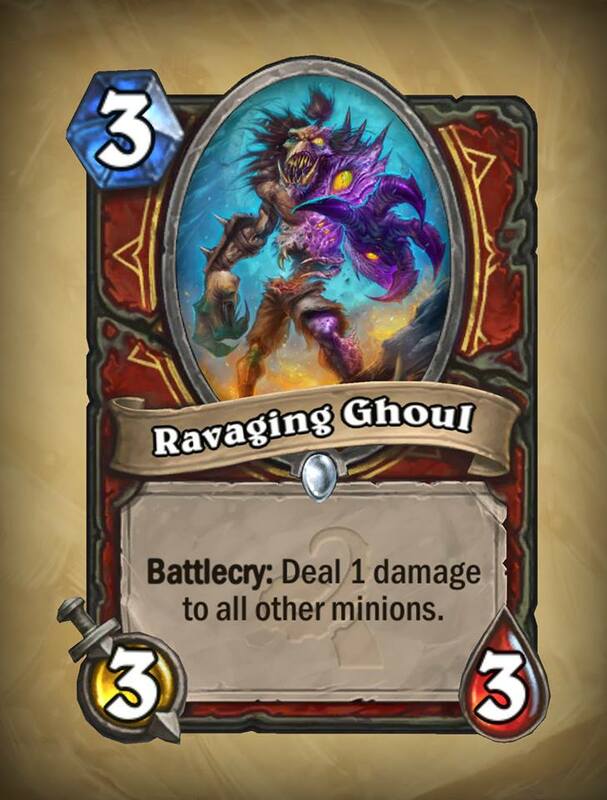 In my view it's a better card than Revenge in that style of deck because it leaves a 3/3 body on the board afterward. 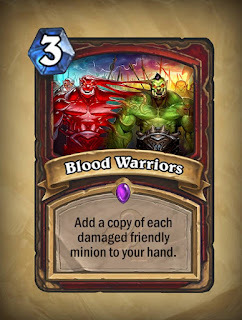 Blood Warriors merits an Good rating because of its utility in all warrior deck styles. Particularly in combination with Thaurissan and something like Whirlwind, it could be used to refill your hand with burst damage such as Kor'kron Elite or Grom Hellscream, or to top up your stalling by replicating taunting minions or Ancient Shieldbearers. It doesn't make it to Excellent because it's probably a one-of tech card. 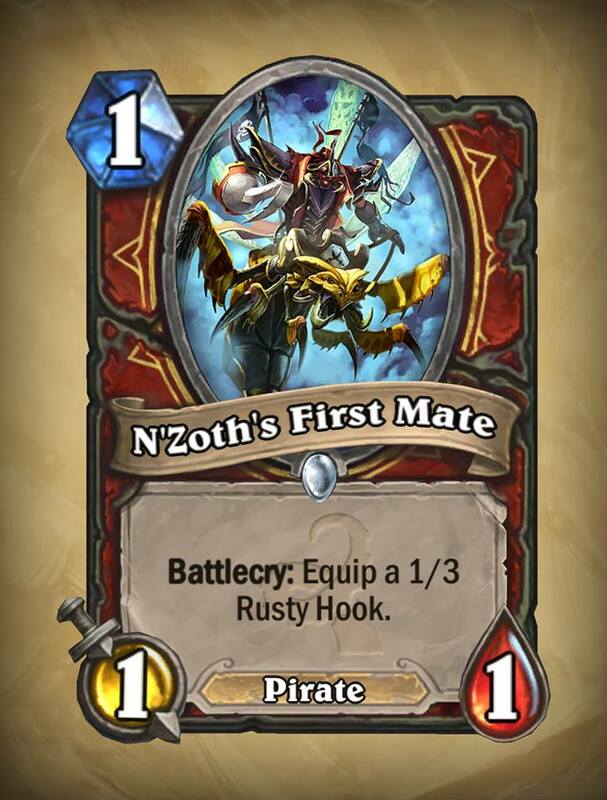 N'zoth's First Mate rates an Excellent rating. In my view it's a natural 1-drop for warriors: for 1 mana you get a guaranteed 4 damage, with none of the downsides of, say, Zombie Chow (not that we'll be seeing much of the Chow in Standard format, though). Gotta keep those mires.... something or other. They're not just your garden-variety, everyday sort of wisp. 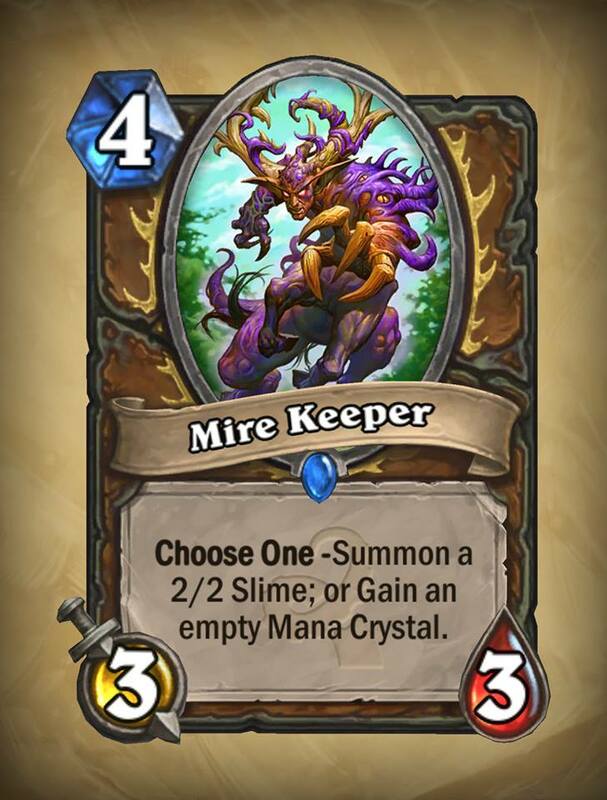 Mire Keeper is a minion that has an effect not unlike Grove Tender, with the benefit that only you get the extra mana crystal (and the drawback that it doesn't draw cards). It's more or less a straight-up upgrade of the Darnassus Aspirant, in the sense that if you choose the mana crystal, you can't lose it when the Keeper dies. 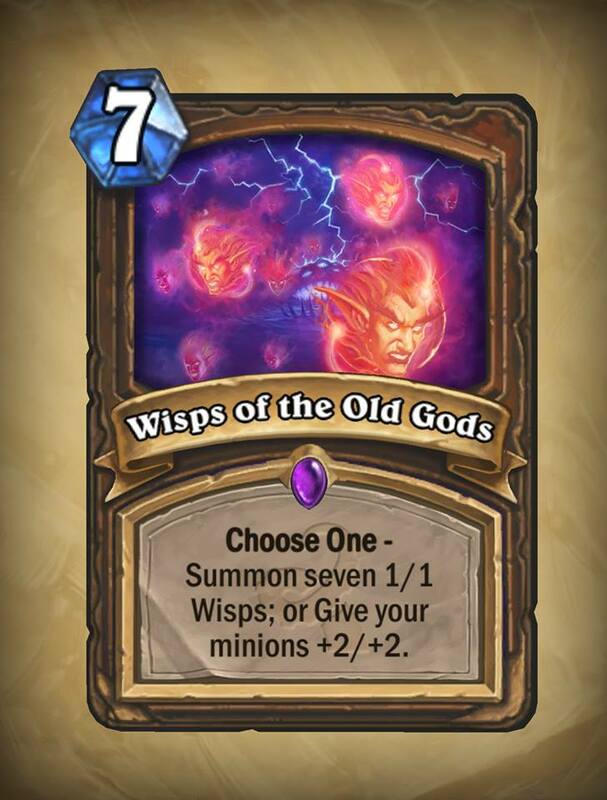 The other option, summoning a 2/2 ooze, isn't fantastic, but it gives the card value (5/5 in stats for 4 mana) and helps boost your board presence. 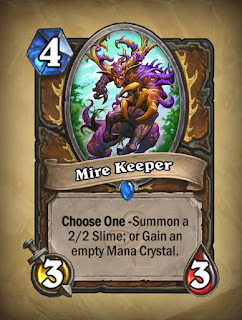 I'm not sure if Blizzard clarified that the Mire Keeper's mana crystal option lets you draw a card if you have 10 mana crystals (as is the case with Wild Growth), but I assume it does since the mechanic is the same. Mark of Y'Shaarj seems like a good fit for a Beast-oriented druid deck, since not only do you buff a minion but you get a card out of it, all for only 2 mana! Wisps of the Old Gods is straight-up outclassed by Cenarius for buffing (because you buff and put a 5/8 on the board), by Onyxia for flooding the board (because you get an 8/8 body on top of the flooded board), and arguably by Power of the Wild because the latter, although it doesn't buff as well, only costs 2 mana. I mean, the card it effectively replaces, Dark Wispers, almost never sees play. You could argue that it works well with, say, Knife Juggler, but then again, if you wanted to run that sort of combo, I'd use Knife Juggler followed by Dark Wispers followed by Power of the Wild. So there you have it, my first batch of reviewed cards. Stay tuned for more reviews!